B&Q is the UK's leading home improvement and garden living retailer, helping customers have smarter homes since 1969. Redeemable on B&Q's extensive range of DIY, garden and home products. For eGift Card enquiries, please call 03330 143090. This eGift Card can be used in full or part payment for products purchased from B&Q stores in the UK (except concessions and cafes in B&Q stores) and also on diy.com. 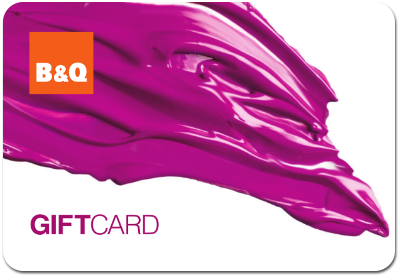 This eGift Card cannot be used for purchases from B&Q call centres, in B&Q stores outside of the UK or exchanged for cash. No change will be given in cash. Any balance remaining on this eGift Card will be shown on the till receipt and can be used in full or part payment for other products. If this eGift Card is lost, stolen or damaged B&Q cannot replace or reimburse the balance on this eGift Card. This eGift Card will expire and any remaining balance will be removed if this Card is not used to make a purchase or balance enquiry during any period of 5 consecutive years. The full terms and conditions applicable to this eGift Card can be obtained at www.diy.com/giftcard. This eGift Card is issued by and remains the property of B&Q plc, B&Q House, Chestnut Avenue, Chandler's Ford, Eastleigh, Hampshire SO53 3LE. Company No. 00973387.